Wed, Thurs. 10 am - 2 pm. 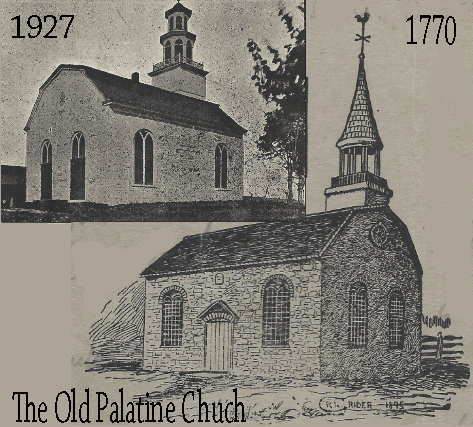 The Old Palatine Church is located in Palatine Church, New York about 2.5 miles north of the village of Fort Plain on the east side of the Mohawk River, the oldest settlement between Utica and Schenectady. The church was built in 1770, the deed dated Jan 2, 1769. It was an American Revolutionary army camp October 19, 1780. The history of the Palatine Church is closely associated with that of Trinity Church of Stone Arabia as bother are Lutheran denominations and were served by the same pastor. St. Paul’s Evangelical Lutheran Church, West Camp, New York was established in 1710 by Rev. Joshua de Kocherthal served 1710-1719. 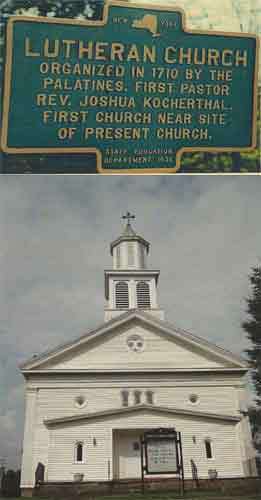 It is the oldest religious society in the town of Saugerties. Pastor de Kocherthal was accompanied by his wife and three children and other families numbering altogether 41. They left England in the same fleet which brought back Lord Lovelace, the Governor of New York and New Jersey. It was Governor Lovelace who on 20 Feb 1669 confirmed freedom of worship to the Lutherans. The old church edifice, which was built of logs, was located about an 1/8 of a mile east of the present church. The Lutheran congregation worshiped in this church until about the year 1732, when, in connection with the Dutch Reformed church built a frame church, locating it about 55 feet NE from the NE from the previous church. The present church built in 1871 was built on or near the location of the church in 1711. The Evangelical Church in Ittlingen is located in the district of Heilbronn in Baden-Wuertemberg. It was originally built in the Middle Ages but though the ages was damaged by conquest, burned in 1666 and rebuilt after. In 1732 it was enlarged. The core of the Romanesque west tower was preserver. Again in 1828 the church was enlarged and in 1988 extensively renovated. This is the ancestral church of the Zartmann(s) and Raupp families. Zartmanns arrived in Philadelphia in 1728. The Raupp family married into the Betz family of Eichtersheim who immigrated to the US in 1850’s because of the 1848 uprising. 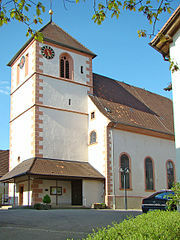 Church records of the Ittlingen church are available from the LDS. Picture of Church By peter schmelzle (Own work) [GFDL (http://www.gnu.org/copyleft/fdl.html) Used with permission with citation. A video showing the church building is available here. St. Michael was founded as a German ethnic parish in 1848.The first church was a frame structure.The cornerstone for this church was laid on July 16, 1848 and the church was dedicated on November 24, 1848. Within seven years, this church was deemed inadequate to meet the needs of a growing congregation and in August 1855 the cornerstone for a new church was laid. This church was dedicated on September 29, 1861 and served St. Michael parish for over a century. Renovations and improvements were made to the church in 1886, 1898, 1923 and 1948. St. Michael is noted for two annual events. In 1849 a cholera epidemic struck the city. After 75 parishioners died of the disease, the congregation of St. Michael made a solemn vow to St. Roch that if they were spared further deaths, they would set aside a holy day within eight days of the Feast of the Assumption. The parish had no further deaths and when another epidemic struck the city in 1854, no parishioners died. Since then the parish has observed Cholera Day every year. In 1910, a Passion Play, Veronica’s Veil, was written in Pittsburgh. The St. Michael’s Players, a parish drama society, first performed the play in 1913. Starting in 1919, this performance became an annual event in the parish, attended not only by parishioners but also by people from around the city and from out of town. Due to population loss in the city, St. Michael was merged with the other South Side parishes in 1992 to form Prince of Peace parish. St. Michael church was closed as part of this merger and the building was sold.